Chapter 812: There’s... Someone There! Of course, Bai Xiaochun could immediately tell what he was thinking. “Is this guy really thinking about stomping me beneath his feet…?” Blinking a few times at how amusing the situation was, he contemplated what would happen if Song Que ever found out who he really was…. What kind of expression would appear on his face? However, even Bai Xiaochun felt that such a thing would be too evil. “Ah, whatever. I'm his uncle after all, and the type of person who is very pure at heart. I can't tell him the brutal truth right now.” Sighing, he mused about how wonderful of a person he was, and also about how loyal and devoted he was to Song Junwan. In the end, it was just like the old saying: if you love me, you have to love my dog too. “Very well then. You’ll be living here now. Focus well on your cultivation.” After offering a few more words of advice, he had Zhou Yixing arrange for Song Que to act as a spirit servant. Song Que took a deep breath, clasped hands and bowed deeply. Sighing, he reminded himself that as long as he stuck close to Bai Hao, then Bai Xiaochun didn’t count for anything! Although he couldn’t consider himself to truly be on Bai Hao’s side, he knew that right now, he had to do anything he could to stay alive. After sending Song Que away, Bai Xiaochun looked around the main courtyard. As the darkness of night deepened, the Underworld River Restricted Area grew increasingly quiet. Back in Arch-Emperor City, the city would be bustling at this time of night. Although the Inspections Manor itself would be quiet, even the areas around it would be alive. But here, everything was dead quiet. Considering how unused Bai Xiaochun was to such a thing, he quickly patted his bag of holding and produced a soulhoarding pagoda, from which Bai Hao flew out. “Nourishing?” Bai Xiaochun said, looking over at Bai Hao and noticing how he looked a lot more corporeal than normal. Surprised himself, Bai Hao nodded, then sat down cross-legged and began to breathe deeply. Almost immediately, he could sense some sort of energy in the area that Bai Xiaochun was oblivious to, which quickly began to pour into his soul body. Bai Xiaochun was very happy about this. Although this whole Underworld River Restricted Area seemed like a boring place so far, if it was helpful to Hao’er, then that would make things a bit more bearable. As Bai Hao continued with his cultivation, Bai Xiaochun sent his divine sense out into the Underworld River Restricted Area. It actually wasn’t a very large area. It consisted of an expansive bluff, at the top of which was the military base. From the military base, the ground sloped down gradually, until a dry riverbed was visible off in the distance. After midnight, that riverbed was where the Underworld River would appear. Retracting his divine sense, Bai Xiaochun sat down cross-legged next to his apprentice to stand guard. As he did, he reviewed the steps necessary to conjure eighteen-colored flame, and mentally rehearsed them to attempt to get more familiar with the process. Time passed. Before long, midnight was approaching. Zhou Yixing had gone out earlier to confer with Wu Dao about a few matters pertaining to the defenses of the military base. Upon returning, he saw Bai Xiaochun and Bai Hao both sitting there cross-legged, with Bai Xiaochun clearly standing watch. The night deepened, until the only light visible was that of the stars and the moon. It was at that point that a knocking sound could be heard on the door of the residence. Bai Xiaochun opened his eyes and watched as Zhou Yixing stepped over and opened the door. After he did, Wu Dao entered, then clasped hands in Bai Xiaochun’s direction. “You’re absolutely right, Fellow Daoist Wu,” Bai Xiaochun replied. “Considering I’ve never seen it before, I should definitely take a look. How about you stay here, and we can observe it together?” In response to Bai Xiaochun’s friendly invitation, Wu Dao sat down next to him and offered some further explanations. “The first time I saw the Underworld River, I was completely shaken,” he said, an entranced gleam appearing in his eyes. “It was almost as if heaven and earth were being opened up in front of my very eyes. It was really shocking.” Just when he was about to say more, rumbling sounds could be heard from the sky. It sounded like heavenly thunder, and immediately caused Bai Xiaochun and Zhou Yixing to both look up into the sky. Wu Dao was the only one whose expression didn’t change. As soon as the words left his mouth, another intense rumbling sound filled the air. The sky distorted, sending ripples out for tens of thousands of meters in all directions, filling nearly half the sky. Something like the sound of water could be heard, which rapidly grew louder and clearer. At the same time, a mist began to fill the Underworld River Restricted Area…. It was a mist that seemed to be filled with an aura of death, the type which could cause frost to appear wherever it went. In fact, it quickly became so cold that the impure vital energy which everyone breathed out transformed into white clouds that floated up into the air…. Bai Xiaochun could immediately tell that the aura of death in the area was unprecedentedly strong. In any other location, such a strong aura of death would indicate that a huge number of vengeful souls was present. But at the moment, Bai Hao was the only soul body visible anywhere. As Bai Xiaochun looked around curiously, the sound of rushing water grew stronger, and the rippling in the sky more intense, as if both space and time were being distorted. The ripples reached the dry riverbed, and then suddenly, river water exploded out from nowhere…. Incredible rumbling echoed out as a majestic river came into being right in the middle of that dry riverbed. Surging and seething, it flowed off into the distance. The river wasn’t clear, but instead, black. As it surged, the restricted area was filled with an even more intense aura of death, and the mists grew denser. The military base on the bluff wasn’t affected, though, allowing Bai Xiaochun and everyone else present to have a very clear view of what was happening. Shockingly, masses of vengeful souls were now visible in the water. Some screamed, some slept, some struggled viciously, some laughed. However, all of them moved with the flow of the river to disappear off into the distance. Bai Xiaochun was shocked, and even Bai Hao had opened his eyes in surprise. Focusing his attention on the river, Bai Xiaochun rose to his feet. He was already very curious about the matter. He had heard many things about the Underworld River since he’d come to the Wildlands, but this was his first time hearing about anything like this. “According to the legends,” Zhou Yixing muttered, “at the true end of the Underworld River… is the Hell-Emperor Palace, within which is that figure which everyone in the Wildlands worships…. The Hell-Emperor!” Bai Xiaochun also thought about the legends of the Hell-Emperor, and couldn’t help but peer through the mists at the Underworld River. Zhou Yixing and Wu Dao were both shocked, and looked down at both banks of the river. However, neither of them could see anyone. “I don’t see anybody….” Zhou Yixing said. “You guys don’t see him? Look, right there! It's an old man…. He’s wearing a black robe… and just sitting there….” Bai Xiaochun closed his eyes for a moment, and then reopened them. Sure enough, sitting right there on the bank of the river was an old man in a black robe, with his back to them. 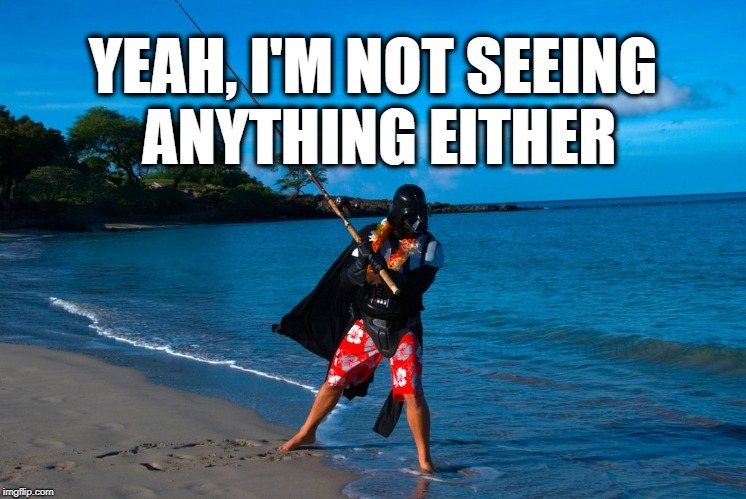 It looked like he was… fishing!